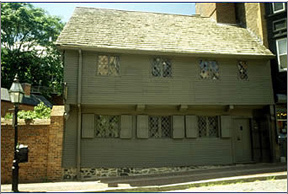 This wooden structure, dating back to 1680, is downtown BostonÂ’s oldest building still in existence. Paul Revere purchased it in 1770 when he was 35 years old. He paid 53 pounds, 6 shillings and 8 pence with a mortgage of 160 pounds. Revere was living at this house the night he set forth on April 18, 1775 to make his momentous ride to Lexington that would be immortalized by LongfellowÂ’s famous poem Paul RevereÂ’s Ride. At any given time during his residence Revere would have shared this house with his mother, and between five and nine of his children (he had 16 in all) and one of his wives. The first, Sarah, died following the birth of her eighth child and Rachel, the second, bore him another eight. For most of the 19th Century the home served as a rooming house and tenement for Irish, Jewish, and Italian immigrants who lived in the North End.